Bengaluru might not be popularly known for budget shopping unlike Delhi and Mumbai but if you explore the corners of it then you will realize that Bengaluru is no less than the other cities when it comes to pocket-friendly shopping. We do not deny that the online shopping has better deals in its store for you but it cannot give you the touch and feel of the real shopping. The feel of delving deep into the crowded markets, bargaining, the chaos we go through and the family time we have has made shopping interesting and fun. Isn’t it? So, if you wish to know the best shopping streets in Bangalore for a full on budget shopping then you are in the right place. Ramachandrapuram is one of those secret shopping nooks situated in the bylanes of okalipuram is a heaven for fabrics and textile shopping. You will be amazed to see that fabrics here are sold in kilos at Rs.300 – 400 and the most loved thing about this place is the availability of modern prints and upholstery fabric. Not only fabrics, you can also buy towels, mats, cushion covers, shirts, trousers and more. It is all in surplus here and the choice you have is limitless. If you are lucky then you can find branded clothes from Lee, Levis, and Wrangler for a throwaway price. Tip: Take someone who had been to this place before and have a lot of patience else you will miss the great deals. If you want to buy fresh fruits and vegetables then come to Malleshwaram market. It will be busy all the time selling various things from tender coconut, chaats, handicrafts, utensils, mangoes (in the season) and much more. You can also visit the malleshwaram old market which is located near to Ganesha temple. Sunday Bazaar at BVK Iyengar road is an amazing way to spend your Sunday as the market opens to different colors and shades showing you an another side of the city. It opens at 7.30 in the morning and continues to bustle till 8.00 in the evening. You can buy anything and everything here from apparels, home decor items, to shoes and fashion items. If you have good bargaining skills then you can buy a wardrobe for just Rs.350 and fake reebok shoes for Rs.50. Do not go for clothes as they last for only one wash. Make sure you check the products twice before you buy. Tip: There will be full of haggling and this street will seriously test your bargaining skills. Beware of pickpocketers. SP road is heaven for electronic goods and second-hand computer accessories. Also, national market is known for it. It is a quite popular shopping destination for electronic and computer accessories. Tip: Compare different shops, bargain, and shop. Chikpet has been the most loved local street shopping destination of Bangalore from the last 30 years. It has everything from clothes, antique furniture piece, utensils, electronic goods, designer sarees, musical instruments, and more in its store, everything at unbelievable prices. The only bustling market of Bangalore that will be filled with shopping freaks and on weekends, it is the most congested place on earth. Tip: The best place to wander around on weekends but it is good if you have something on the mind to purchase. It will be crowded and so stick to the main streets and have an eye for your children. Avenue road is the best place we have in Bangalore to buy/sell books and it is a boon for students and book lovers. Situated near to Chikpet, the road has food carts, a variety of shops selling stationery items, jewelry, and much more which you won’t find in other parts of the city. A heaven for second-hand books and so only known as the bookworm’s paradise. Tip: If you wish to buy xerox notes and helpful guides to prepare for the competitive examinations then Avenue road is a must visit. Dubai plaza has no direct connection to Dubai in any sense. It is a mini street quartered inside the building on the Rest house road where you can buy clothes, cosmetics, shoes, bags, fashion ornaments, wallets, and much more. In the basement, you will find the Tibetan plaza that sells sarees, shirts, kids wear, chudidars and every single gizmo of clothing. If you are a conscious shopper always looking for the better deals then surely check into Dubai Plaza. Tip: You may end up purchasing the old stock and defect pieces. Kindly check before you bill them. Well, most people might have visited the BDA complex situated in the 4th block of Jayanagar. It is one of the popular street shopping places of Bangalore that houses the stores and shops selling groceries, clothes, books, novelties, shoes, and other home decor items. Knock the roadside vendors in the complex for the better deals. Tip: Look for the smaller shops. Explore more to find something trendy and of good quality at relatively a lower price. One of the crowded markets circumscribed by Honkong market and Burma Bazar will definitely awake the shopaholic in you. The market surprises you by selling both local and branded products like perfumes, clothes, electronic gadgets, fancy accessories, and china items. This is one place where you can prove that you have a pretty good bargaining skills, the best place for bargainers. Shivajinagar street is one such shopping destination that shelters various stores and complexes like star plaza, Burma bazaar, hibaw shopping complex, Jayaram market, soap bazaar, textiles market, and much more. Everything you want to buy is under one umbrella right from clothes, furniture, antique items, kids wear, masala items, to sports and other home accessories. All you get here is the best deals and the quality goods. Tip: Explore more to find the best of Shivajinagar. Jayachamarajendra Road or JC road is a must visit place for a budget shopping of vehicle accessories. You will get all the auto products here at a quite reasonable price compared to other parts of the city. Also, you can get in touch with car accessory dealers and second-hand bike dealers. You can also visit places like Brigade road, Commercial street, and Gandhi Bazaar for your shopping. Leaving streets aside, we have outlets like Decathlon for sports, the brand factory for apparels, and metro shops where you can buy things at the wholesale prices. Hey, how did you like this? Did we miss any places? Please comment the best shopping streets you have walked into. 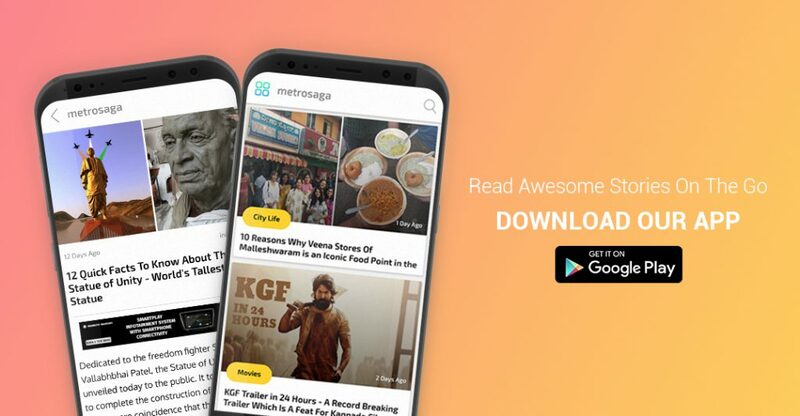 For more on Bengaluru and other interesting articles, subscribe to MetroSaga today.